Having located a mysterious newspaper ad reading, "Got a problem? Odds against you? Need a guy to play some kind of cop or agent or something?" 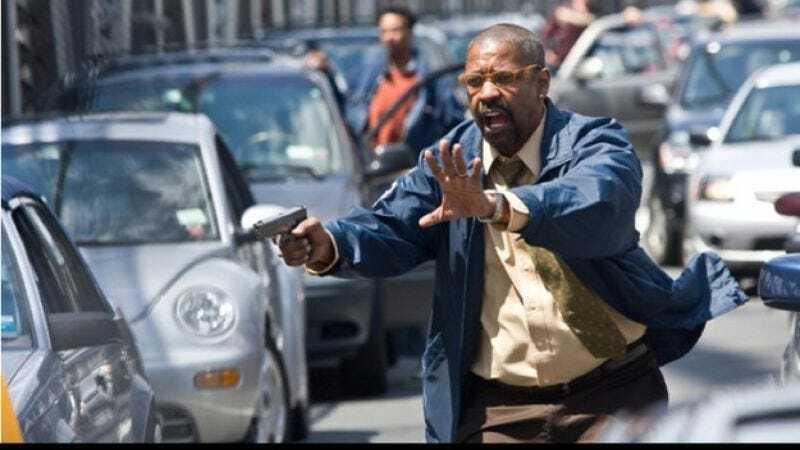 and dialed the listed phone number only to have Denzel Washington pick up, Sony has hired Denzel Washington to star in The Equalizer, its long-gestating big-screen update of the 1980s series starring Edward Woodward. At last report, Crash director Paul Haggis was considering giving the film his own unflinching, overprotective-suburban-mother-who-just-doesn't-understand-why-you-can't-attend-state-college vision of the big city, while Russell Crowe was attached to elbow that city in its dirty mouth. But now the the studio is working through a short wishlist of directors that includes Drive's Nicolas Winding Refn, Warrior's Gavin O'Connor, The Raid's Gareth Evans, and Taken's Pierre Morel, suggesting that the would-be franchise will have fewer civics lessons and more stylized punches. And though the adaptation is only "loosely based" on the show, suggesting his background and mythology may not be the same, Washington's character will still be similar to Woodward's TV version in that he, too, will be some kind of vaguely defined covert ops agent helping people in trouble. "And then some other stuff—you know the drill," Washington's agent said, as his client signed the contract like always.